Brief information about the title, such as author, edition, publication date, etc. is displayed under each title. The icons beside the brief information indicate formats such as books, audio books, video recordings, and other formats. If you hover your mouse over the icon, a text explanation will show up in a small pop-up box. Clicking a title goes to the title details. Clicking an author searches all works by the author. If you want to place a hold on the title, click Place Hold beside the format icons. On the top right, there is a Limit to Available checkbox. 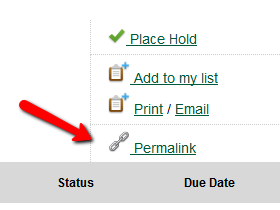 Checking this box will filter out those titles with no available copies in the library or libraries at the moment. 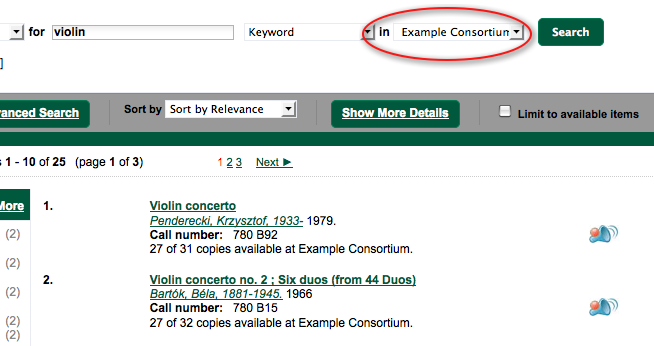 Usually you will see your search results are re-displayed with fewer titles. The Sort by dropdown list is found at the top of the search results, beside the Show More Details link. 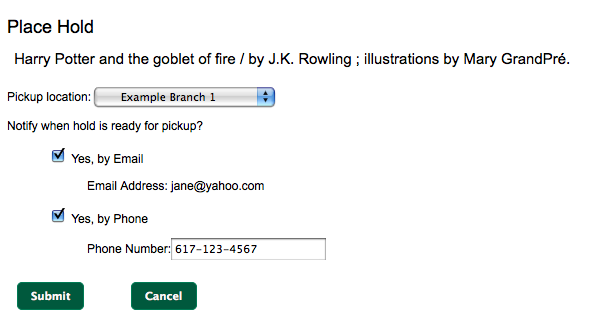 Clicking an entry on the list will re-sort your search results accordingly. At the left, you may see a list of Facets of Subjects, Authors, and Series. Selecting any one of these links filters your current search results using that subject, author, or series to narrow done your current results. The facet filters can be undone by clicking the link a second time, thus returning your original results before the facet was activated. 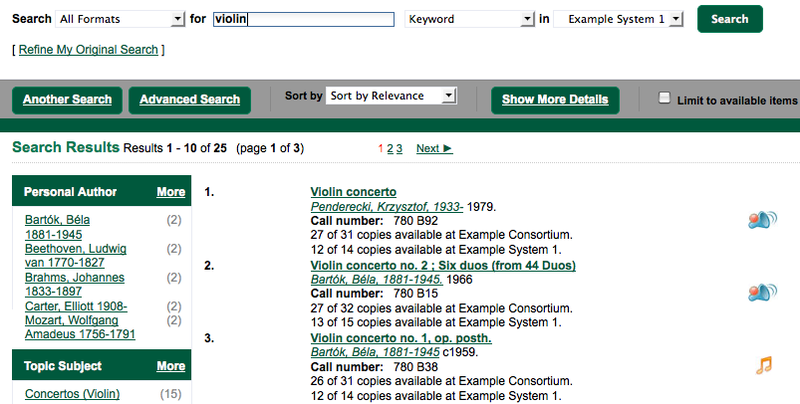 The number of available copies and total copies are displayed under each search result’s call number. If you are using a catalogue inside a library or accessing a library’s online catalogue from its homepage, you will see how many copies are available in the library under each title, too. 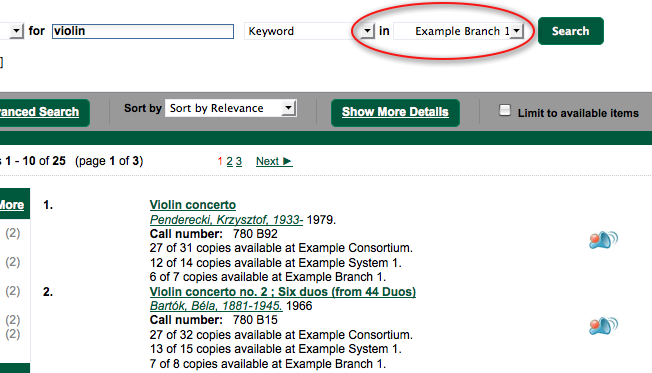 If the library belongs to a multi-branch library system you will see an extra row under each title showing how many copies are available in all branches. You may also click the Show More Details link at the top of the results page, next to the Limit to available items check box, to view each search result’s copies' individual call number, status, and shelving location. Click on a search result’s title to view a detailed record of the title, including descriptive information, location and availability, current holds, and options for placing holds, add to my list, and print/email. You can view and cancel a hold at anytime. Before your hold is captured, which means an item has been held waiting for you to pick up, you can edit, suspend or activate it. You need log into your patron My Account to do it. From your account you can also set up an Cancel if not filled by date for your hold. Cancel if not filled by date means after this date, even though your hold has not been fulfilled you do not need the item anymore. The record summary page offers a link to a shorter permalink that can be used for sharing the record with others. All URL parameters are stripped from the link with the exception of the locg and copy_depth parameters. Those parameters are maintained so that people can share a link that displays just the holdings from one library/system or displays holdings from all libraries with a specific library’s holdings floating to the top. If configured by the library system adminsitrator, you may send yourself the call number via SMS message by clicking on the Text link, which appears beside the call number. 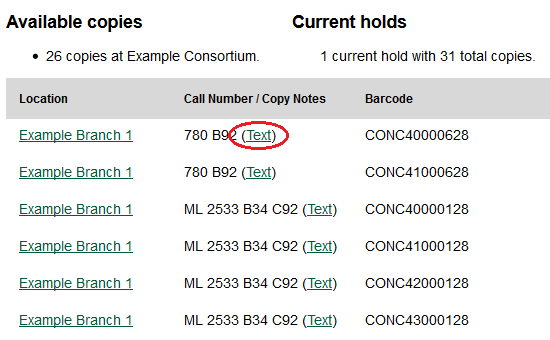 See the Sending Copy Details via Text Message section of the documentation for more information on how to use this feature. Carrier charges may apply when using the SMS call number feature. 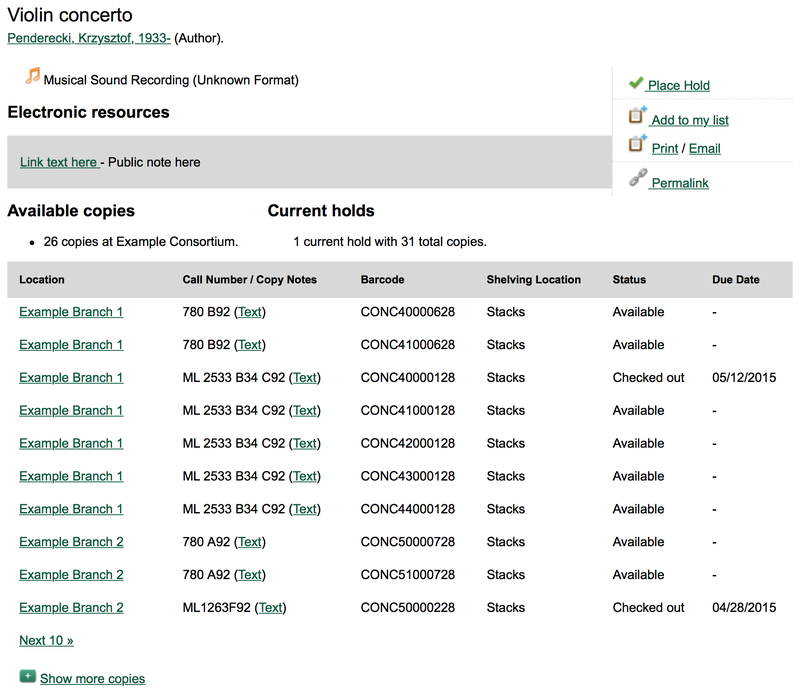 Near the bottom of the record, the copy summary shows how many copies are at the library or libraries you have selected, and whether they are available or checked out. It also displays the Call Number and Shelving Location for locating the item on the shelves. 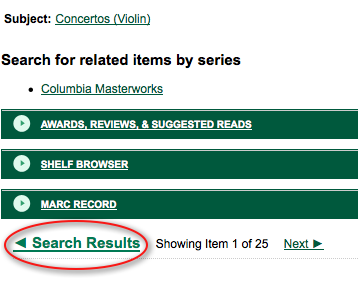 You can click Shelf Browser to view items appearing near the current item on the library shelves. Often this is a good way to browse for similar items. You can select Table of Contents to see the book’s table of contents online (if available). You can select MARC Record to display the record in MARC format. You can also select Awards, Reviews, & Suggested Reads and Additional Content to see more details (if available). When you are viewing a specific record, you can always go back to your title list by clicking the link Search Results on the top right or left bottom of the page. You can start a new search at any time by entering new search terms in the search box at the top of the page, or by selecting the Another Search or Advanced Search links in the left-hand sidebar.